Get to know the old customs and latest trends that make a Philippine wedding truly Pinoy. Filipino weddings are community-wide feasts. Originally, it takes 3 days and a whole village to hold a real wedding. With the dawn of Spanish influence, local weddings, especially in the cities, have become more like western nuptials. That’s not to say we’ve totally lost traditions that give our weddings a truly Filipino flavor! 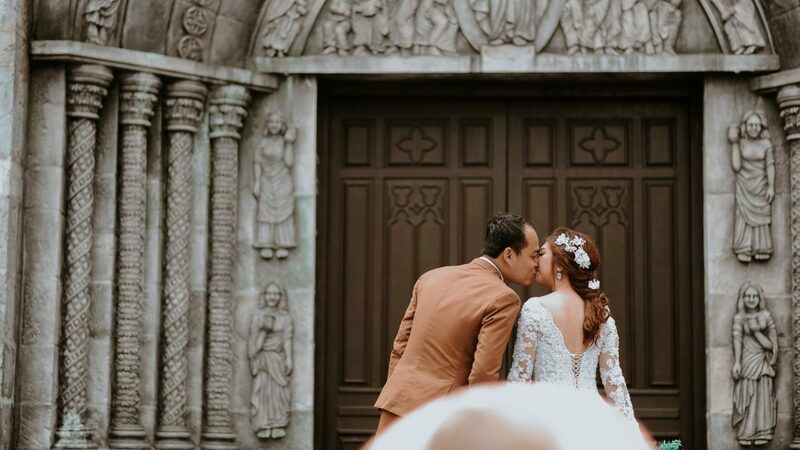 As an expat, here are a few things you need to know about how to approach and execute a truly Pinoy wedding. Getting engaged here requires so much more planning and even more guts to do. You’ll also need extra supplies of social skills, charisma, and spending money to pull off this pre-wedding checklist. Having the perfect Philippine wedding begins even before someone pops the question. While the Filipino community has advanced with regards to gender equality, still, this is a predominantly patriarchal society. As such, if you’re a guy, you have to ask your girlfriend’s father for her hand in marriage. You can do this in secret or in front of everyone – it’s your call. Although it’s not that common nowadays, brides’ parents still expect some sort of pamamanhikan – this is a form of “serving” the bride’s parents and family to show your earnestness about your request for marriage. If you watch old Filipino movies, you’ll see guys doing household chores like chopping wood or feeding the chickens. Of course, the concept of pamamanhikan remains but the execution has evolved. Modern pamamanhikan can be as simple as giving gifts or treating your future in-laws to a weekend getaway. Family is very important in Filipino culture. Marrying a Filipino will not only include you in the immediate family – you’re going to have to know pretty much the whole family tree up to the 3rd degree. When parents of both parties meet, this means it’s on. Be ready to listen to endless suggestions that are usually followed by an anecdote about a friend or relative. This can also be your official pamamanhikan day. To get everything out of the way, you can also schedule your bisita on this day. It’s the formal announcement of your intention to marry to all of your bride’s relatives by personally visiting them and handing them your wedding invitations. This is also when you ask some of them to be your “sponsors” (we’ll get to that later). There’s a superstition that dictates siblings cannot get married in the same calendar year. If this happens, then the second wedding is a sukob and thus will bring bad luck to either or both couples. This concept even spawned its own horror movie! Gone are the days when getting engaged is a simple private affair between the couple. These days, “engagement events” are all the rage. While it’s not uncommon to get your friends to help you stage a memorable question-asking, the sheer production value of the whole thing has escalated. Today, some guys even hire a planner, stylist, photographer, and videographer for this event. Who’s Paying for the Wedding? As mentioned, this is a patriarchal society so the man and his family are expected to pay for the whole thing. This is because the bride’s family is entrusting their daughter to the groom, and as such, the groom should prove his ability to provide for her, starting with the wedding! Of course, modern brides are open to sharing the expenses. Sometimes, the bride’s parents will gift the couple with a big appliance, a car, or an apartment as their “contribution”. This is the part where you get officially hitched! One year of your life will be spent trying to make this day as memorable and problem-free as possible. Most Filipino wedding ceremonies are done in a church, but recent trends saw a rise in destination weddings as well. If you’ve seen a Hollywood chick flick, then you know what happens in a wedding. Philippine church weddings are pretty much the same, save for these additions. Your wedding entourage is not limited to a maid of honor, best man, a couple pairs of bridesmaids and groomsmen, flower girls and a ring bearer. Typically, the parade down the aisle consists of over two dozen people, not including the couple and their parents. Principal sponsors are your “wedding godparents” or ninong and ninang sa kasal. Just like how normal godparents work, these older couples have the duty to guide you through the highs and lows of your marriage. Secondary sponsors are friends or close relatives who are responsible for performing the wedding elements. These elements are almost as important as the rings. Each one holds a special meaning. The Veil represents unity and purity. The Cord represents the bond this wedding makes. The Candles stand for light in the marriage. The Coins or arras stand for the groom’s promise to provide, or the couple’s promise to help each other make a life together. Traditionally, they use 13 pieces of actual peso or centavo coins. These days, you can get customized coins in precious metals like gold and silver. Rice grains are replaced with party poppers as the first congratulatory greeting for the couple when they exit the church/venue. It’s likely due to how wasteful scattering perfectly good rice is on the ground just for “good luck” when there are so many going hungry. Finally, the last leg of the journey before your ever after starts! Filipino wedding receptions are very merry and festive events that will not let you go home hungry and may even earn you some money! You’ll probably spend so much time finalizing your guest list and seating arrangement just to make all 300 relatives, friends, neighbors, and business partners fit. It’s also a good idea to set aside an extra table, just in case. You’ll never know who’s going to bring an extra person – it happens quite often. Also, expect to see only a third of your reception guests at your actual wedding ceremony. While everyone who got the invitation is invited to both, most people opt to skip the ceremony, especially if they’re not really that close with the couple. Wedding games used to be limited to the groom hiking the garter up the bride’s leg as much as publicly acceptable. The entourage played a few parlor games as well. These days, wedding games involve all of the guests. While the newlyweds take photos with each table, it can get a bit boring for everyone else. This is why couples usually plan some games with their organizers. Usually, it’s a trivia game about the couple. Other times it’s totally random like a rock-paper-scissors tournament with a huge cash prize! After the guests have had their share of food and all the AVPs and picture-taking are done, it’s time for the couple to share their second dance of the night. Sponsors and guests pin cash or money envelopes on the couple’s clothes to help them get a head start on their life together. This Instagram-driven society will not let a major event like a wedding end without letting the world know it happened via a million photos. And what’s Instagram without the hashtags, right? These custom wedding hashtags often play with the couple’s names. They’re 99% punny, funny, and sometimes cringey, but that’s what makes them unique! Mobile bar, anyone? How about unlimited ice cream? A photobooth? A balloon castle for the kids? You can virtually get anything for your wedding reception nowadays. Of course, receptions held outside hotels get more flexibility when it comes to including their favorite food carts and such, but if you have the budget for huge corkage fees, you can probably bring in a fishball stand in a hotel wedding hall! These traditions are for typical modern Filipino weddings. But it’s good to note that the Philippines has had so many influences from colonizers and early foreign settlers that a significant part of its citizenry actually has their own subsets of wedding traditions depending on their root culture. There are also Filipino families that hold onto ancestral traditions of indigenous Filipinos. Some have created their own traditions. These differences give color and texture and a sense of wonder to what could become your very own Philippine wedding.